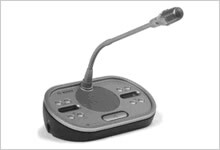 The Discussion Unit with Dual Channel Selectors enables participants to speak, register a request-to-speak and listen to the speaker. A socket is provided to connect a pluggable microphone. The unit has two built-in channel selectors with headphone connections with individual volume controls on either side of the unit, allowing one unit to serve two delegates. The channel selectors make it suitable for discussions in which more than one language is used and simultaneous interpretations are available. Each of the channel selectors includes up and down channel select keys and a display showing the number and the abbreviation of the channel name, enabling rapid selection of the required language channel.